Dealing with a tree stump? Here’s everything you need to know about grinding stumps and removing them. After a major storm or high winds, downed trees are a major hazard. Falling trees and branches can crush cars, homes, and people. To reduce the chances of damage, people often spend hundreds or thousands of dollars on tree care. Sometimes, though, the only answer is to completely remove the tree. Or maybe you’re clearing some land to build. Tree trimming services might take down all the branches and cut the trunk to the ground. But what happens to the stump? You have a few choices: leaving them alone, removing stumps, or grinding stumps. Read on to learn more about your options. So why bother removing them? They will eventually decompose, you think. Well, it is true. A stump will definitely decompose with the right amount of oxygen, moisture, and microbes. Eventually can mean a very long time. Often, it means a decade or more for very dense woods. In the meantime, you have an ugly lump of dead tree sticking out of your meticulous planting. It’s going to take up space that you could be using for something else like a garden bed. Or maybe the stump isn’t out of the way. In that case, you have an unappealing and dangerous bump in the middle of your lawn or walk. Maneuver around the stump at your own peril. If someone trips and falls, or worse, get injured when a mower or trimmer hits it, guess who gets sued? The worst outcome if you leave it alone? The stump tries to grow back. Unsightly tufts of weedy treelets spring from the root tips and remaining trunk. The tiny trees leach more nutrients from the soil than you think. They support a full-size tree root system! Can You Remove a Stump Without a Grinder? The answer is a qualified “sort-of”. If the conditions are just right and you have the right combo of tools, tolerance for chemicals, or a large truck, you can get a stump out. The question is how much risk are you willing to take? Also, if you manage to get the stump out, what do you do with it? Burning, chipping, and trash pick up are possibilities. Not all trash services will accept the stump and root ball, however. But there are alternatives to brute force. Chemicals that stop stump regrowth are non-discriminatory. If they spread, they can also affect the growth of the plants you do want to keep. Sure, the packets of powders say that they contain harmless enzymes, but do you really want to test them out to see if they leach into your groundwater? Most modern stump removal chemical formulas have potassium nitrate (saltpeter) as the active ingredient. This chemical compound contains a high concentration of nitrogen. It is used as an ingredient for food preparation, gunpowder, and fertilizer. Its purpose in stump removal is to speed decomposition. The majority of chemical stump removal products are powders or granules. Some formulas are liquid-based, but most people find powders easier to apply. Liquids splash and evaporate, which is less effective in speeding decomposition. Too much fertilizer can cause algae blooms and vegetation overgrowth in Florida waterways. Potassium Nitrate and other chemicals can affect birds and wildlife. Avoid them! So this leaves two other choices: remove or grind. Stump removal prices vary. It depends on the size and depth of the root ball, the terrain, and other factors. The cost to remove a stump professionally vs. DIY is large, but most people prefer to skip this back-breaking work. 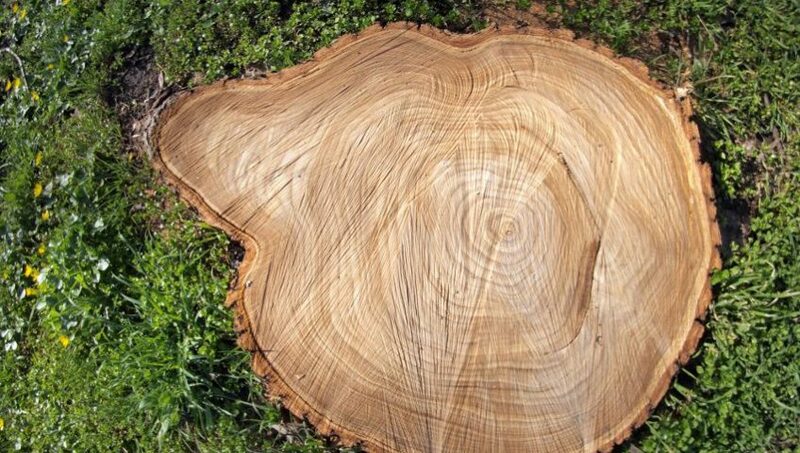 The national average cost to remove a tree stump ranges from $60 to $350 per stump, depending on various factors like size and tree species. The average removal cost breaks down to approximately $2 to $3 per inch diameter of the stump. Don’t get hung up on this average though, as Florida trees can have extensive root systems that require lots of digging. Stump removal is the complete eradication of the root ball and remaining trunk of a tree that has already been harvested. Tree services generally handle all of the tree above ground. Stump removal involves the extraction of nearly the same mass underground as the tree had aboveground in life. If you are planning to build on the land, you will need to completely remove the stump. The process is labor-intensive, back-breaking, and time-consuming, especially if attempted by hand. Cave dwellers of the previous ice age would find the axes, shovels, picks, or mattocks recognizable. A mattock is a tool with a digging head and a sharpened, flat end for slicing. You also need a heavy utility pry bar with a sharp end, as well as a small and a large bow saw. Wear heavy gloves and sturdy shoes for safety. You have lots of soil to move. Ready? Be careful that the area is clear before swinging an ax. Clear out people, pets, or objects like overhead power cords before you begin swinging. If you are unfamiliar with the tool, take the slower route and use a saw. Safe handling of an ax requires some education, practice, and the correct blade for the job. Aim the ax so that it does not strike dirt (which dulls the edge blade) or bounce back (which could impact your head). Always check that the ax head and handle are firmly connected. Wear steel-toed boots when using an ax. A little more pricey but faster are the use of a backhoe, bulldozer, or other heavy equipment. There are several instances of hilarious videos going viral, all involving amateur stump removal and trucks. Do not risk injury or damage to your vehicle. Just don’t. Call in the professionals if you need to use heavy equipment. Wet or heavy soil can be treacherous. You may find that water saturates the soil quickly as the tree roots are removed. Once the stump and roots are removed, you will have a very large hole to fill. You must refill the soil and compact it before building on the spot or reclaiming it for a lawn. If you are replanting with another tree, you will need to in-fill with a good quality soil and mulch. Stump grinding is faster than chemical stump decomposition. It is less expensive than full removal. It can be DIY or performed by a professional. Stump grinding can more economical than full removal. A mechanical grinder is used to break the remaining trunk and large roots to bits, several inches below the surface. Deeper is better, of course. This is then left to mulch and the whole thing is covered with soil or sod. The root ball is not removed, so there is no need for large amounts of fill dirt. Over time, the root decays. Stump grinding is ideal for areas not under cultivation. If you need to build on the area, choose full stump removal. The slow process of root decay will eventually cause subsidence. You can rent a gas-powered stump grinder in any big box store with a tool rental counter for around $150 per day. The number varies with the size and power of the equipment. Even one stump is a few hours of work. With so much heavy-duty machinery in your hands, remember with great power comes great responsibility. Make sure that someone explains the controls. You’ll need a powerful vehicle with a trailer hitch to tow the grinder. The grinder weighs nearly 1000 lbs. Once you get the grinder home, safety first. Never use a stump grinder without wearing eye and hearing protection. Wear long trousers and sturdy, closed toed-shoes. Steel-toed boots aren’t a bad idea. Clear the area and make sure you understand the controls. Use a shovel or mattock to remove stones, brick, or concrete from around the base of the stump. This is critical, as they can dull or damage the teeth of the cutting wheel. Also, the grinder can fling rock chops or sparks with devastating effects. Use a chainsaw to trim the stump flush to the ground. You can skip this step if you don’t have a chainsaw, but the job will take longer. Raise the grinder wheel above the stump with the hydraulic lever. Give yourself a few inches clearance. Move the machine into position with the wheel directly over the front edge of the stump. Start the grinder wheel and slowly lower it into the stump a few inches. Use the hydraulic lever to swing the wheel from side to side to clear chips. Dig at least 4″ down. Raise the wheel and drive forward another few inches. Repeat the whole process until you have pushed through the entire stump and main roots. For your safety, work slowly. Stay well back from the grinder wheel, with your body behind the controls. Wear your personal protective equipment, and beware of flying debris or sparks. After you have completed your slow grind through the stump, stop to check your depth. Stop and check to make sure that you have ground at least 4″ below soil level to limit regrowth. Rake up and remove all the wood chips and debris. Fill remaining depression with clean, screened topsoil. Lightly compact the new soil with a tamper. Lightly rake the dirt and seed with grass. Rake seeds into dirt and water the area. Add mulch to retain moisture. To allow grass to grow, water frequently in high temperatures. This step is unnecessary in colder weather. Safety Reminder: Never stump grind under the influence. Wear closed toe shoes and proper personal protective equipment. Stand behind the controls as far from the grinder wheel as possible, because sparks and debris can cause damage and injury. Professional removal is always your best choice. Grinding stumps, digging them out, or chemical treatment are DIY for small jobs, but overwhelming for larger ones. Grinding and removing stumps are certainly the most reliable ways to prevent regrowth. If you have a large amount of land to clear for building, full removal of stumps is recommended. Stump grinding is an economical choice for land that will not be paved or build upon. Stumps ground several inches below ground rarely grow back. The remaining roots will slowly decompose and become part of the soil. Very little fill dirt is required to level the site after grinding. Now that you know all about grinding stumps, feel free to contact our experts today to learn more about tree root removal, cost, and alternatives. ACI Land & Aquatic has 15 years of Florida tree experience, from Fort Meyers to Sarasota. Let us help you open up your water view, clear land for construction, or remove invasive Brazilian Pepper trees. We remove trees and stumps, grind, and mulch.